Hello Lexingtons! I'm waiting for my New York flight and thought I would write a cheeky post. I'm redoing my room and need a place to put my jewellery. At first I put all my necklaces in a pretty glass bowl but within a week, they we all tangled together and were just a plain hot mess! I found nothing online I liked (even on Pinterest) but then I came up with this fab idea on how to make one yourself very easily and cheaply too! 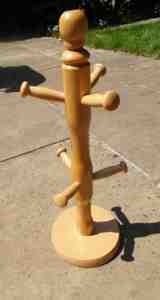 The first thing you will need is a mug tree. Don't get a brand new one but buy one from a charity or thrift shop. I picked mine up for a few pounds in Cancer research. Now, in my opinion, this is way too plain. The next stage is to jazz it up! Take some nail polish remover and make sure it contains acetone. With a cotton pad soaked in the remover, rub the stand all over. This gets rid of the varnish wooden furniture often has so we can paint it. 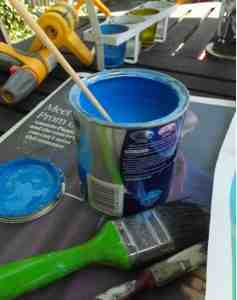 Next, choose your paint colour and make sure it's for painting wood. I chose this pretty blue colour. Stir your paint and get a small paint brush. 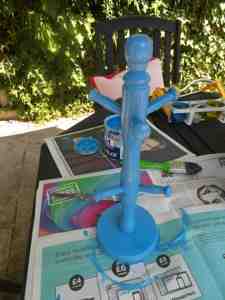 Paint the stand with a light layer first, and then once it's dry go in with a second or third coat if necessary.